Pleasant, if a little bland, town centre pub. Beer good but seems aimed at a dining clientele. Nice Pub ,Ale a bit on the pricey side but a good vibe .Also able to stand outside with a Pint ,was very busy on a Saturday evening at 6pm. 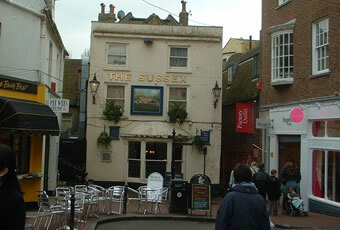 Stopped by The Sussex a couple times during a brief stay in Brighton late last year, good beer, good food and friendly staff, and an especially nice atmosphere when we came in dressed up for Halloween. Pro tip - If you're in this pub and dressed up for Halloween, sit at the table facing the side entrance and you can scare loads of people walking down that alleyway! Lovely pub ,with good food.